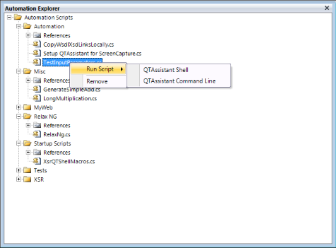 QTAssistant Shell provides support for automation through scripting. The scripts can be executed In-Process and Out-of-Process. 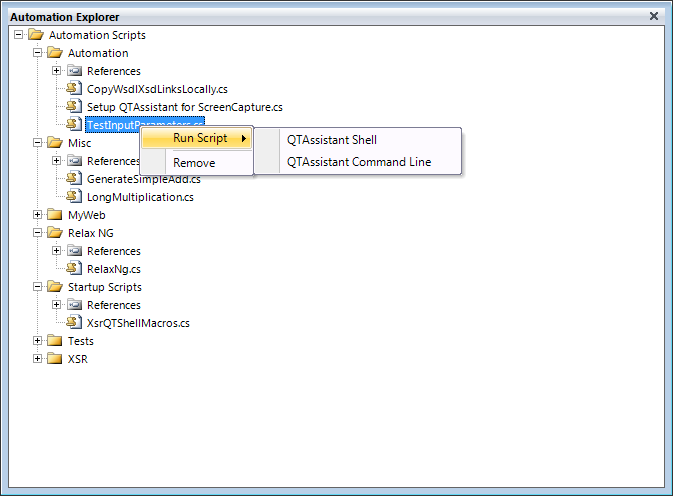 A script running in-process has access to all shared resources in the QTAssistant shell; an out-of-process script execution relies on a separate surrogate .exe, and it has limited access to the resources in the QTAssistant shell. The same surrogate .exe may be used to drive functionality using command line tools, or to create Windows Explorer shortcuts as a convenience method to easily invoke QTAssistant functionality, even without loading QTAssistant and its modules. While some of the examples below use full path names to the executable, we do not consider it as a best practice. By default, QTAssistant installer uses a version specific directory for its files, including the surrogate .exe. As such, references that use the full path name for the surrogate .exe may not resolve anymore once a new version of QTAssistant is installed in another folder. Irrespective of the migration policies in effect for your QTAssistant deployment (e.g. 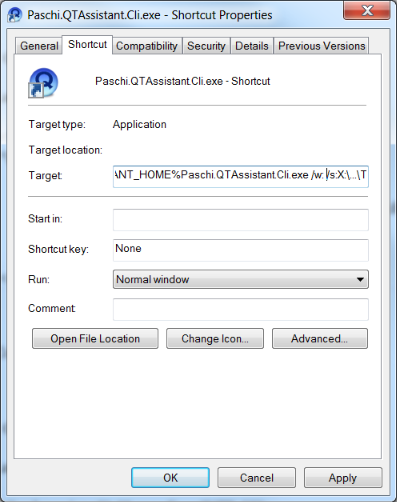 side-by-side vs. single version in an invariable folder), we recommend the use of environment variables, such as QTASSISTANT_HOME to configure the use of a specific QTAssistant version, or PATH, by adding the install folder to it. 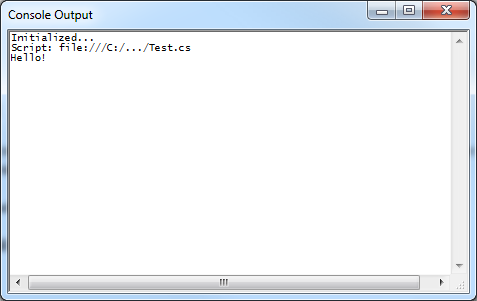 The following C# script (named Test.cs) is used to illustrate various ways to run a script using the command line interface. Starts a separate process to run a specified script. /s:<script path> The full file name of the script to run. /a:<assembly path> One full file name for each .NET assembly reference. /w: Display a separate window to capture messages. /c: Allow messages to be captured by the parent process. /p:<script parameter> One for each parameter passed to the script. start /b /wait Paschi.QTAssistant.Cli /s:"X:\...\Test.cs" /p:"Hello!" If an environment variable is not desired, the full path can be used instead. The w switch is used for scenarios where a console is required to capture the messages generated by the script. Other approaches may rely on pre/post-build events, using the same command as above. msbuild /nologo /t:Rebuild /verbosity:m /p:Configuration=Debug /p:Platform="Any CPU"